One of my favorite Italian dishes ever is Chicken Parmesan. When I started the whole Paleo thing, I knew that it was one of the dishes that I wanted to Paleoize. Is that even a word? Probably not. Now it is. So here you go, the Primal Primos Paleo Chicken Parmesan. Make sure to also make our Marinara Sauce ahead of time for use in this dish! Way better than any store-bought sauce. Step 1 Add your oil to a frying pan and place over medium-high heat. Step 2 While the pan is heating, take your chicken breasts and pound them to a uniform 1/2" thickness. Step 3 For our dredge stations, first crack the eggs into a shallow dish or bowl and beat. Step 4 In another shallow bowl or dish, combine our: coconut flour, basil, oregano, crushed chili flakes, parmesan cheese (if using), salt and pepper. Step 5 Dip the chicken first into the dry ingredients, then the egg, then back into the dry ingredients. Step 6 Place the coated chicken breasts in your hot pan and cook until the outside is golden brown and the chicken is done. **If you're having problems with the coating becoming too brown while the chicken is still underdone, then turn the heat down on the stove. If this doesn't solve the issue, remove the chicken from stove and place in a 350 degree oven to finish cooking through. Step 7 Remove chicken from pan and place on baking sheet (or aluminum foil, for no mess). 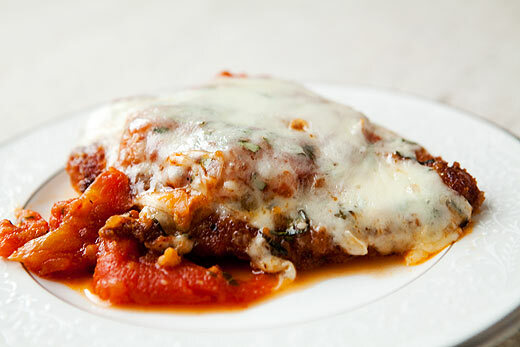 Top with Primal Primos Marinara Sauce and a slice of mozzarella cheese (if using). Step 8 Then place baking sheet under broiler until cheese melts and browns slightly. DREDGING TIP: Most dredging is done with flower, egg and bread crumbs. You would typically dredge the chicken in flour, then in egg, then in seasoned breadcrumbs to form the delicious crust that we love on Chicken Parmesan. The point of the first flour step is to dry the chicken off enough to give the egg wash something to adhere to. That way the breadcrumbs can then stick to the egg. Skipping the first flour step is normally the reason why the coating falls off while pan frying. In our case, we can't use breadcrumbs, so we're having our coconut flour mixture play double duty. First dip the flour, then egg and then back in the flour for a delicious coating that stays on your chicken! 4 Responses to "Paleo Chicken Parmesan"
Where does the arrowroot powder go? What if I don't have arrowroot powder? I have coconut and almond flour and xantham gum.